Where did I put that Camera..? As a professional speaker I find it difficult not to criticise others on stage about this or that. Is their layout good? Are their images of high quality? Can the presenter speak well and engage their audience? This was an evening where I had nothing to worry about. Julie Summers presented ‘Everest needs you Mr. Irvine’ at Derby Guildhall and stunned us all with her incredible knowledge, depth of research, wonderful pictures and heartfelt passion about her Great Uncle, Sandy Irvine. So much of history talks of George Mallory, whereas Julie brought ‘and Irvine’ out of the shadows. She had found old family papers, letters and pictures hidden in attics and drawers to piece together so much that we never knew about this young, strong undergraduate at Oxford. It was the Great Trigonometric Survey of India which first calculated Mt. Everest to be the world’s highest peak at 29,002ft (an incredibility accurate measurement for the day). As Britain had lost the race to both the North and South Poles, the race to climb the 3rd Pole (as Everest became known) was important for the status of the Empire. A cartography and mapping Expedition was sent out in 1921 to find routes to the mountain and to assess if it could be climbed. Here is where Mallory enters the story, but lets go back to Irvine. Born in Birkenhead in 1902, Irvine soon established himself as articulate and inventive. Indeed he sent designs to improve the firing of aircraft machine guns to the war office during WW1. He progressed to Oxford where his strength and energy saw him row in the 1923 Boat Race. Julie presented moving footage of him in the race; a refreshing note to many of us today who think the time is only remembered in old, black and white still photographs. 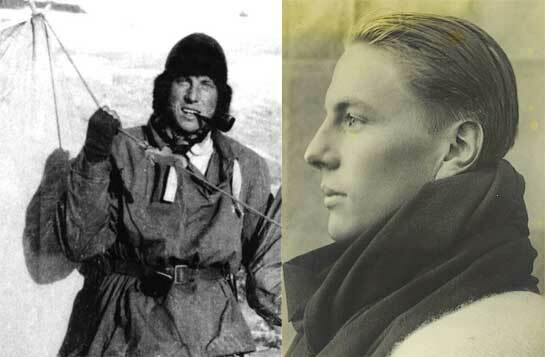 After climbing in Wales and taking part in a skiing expedition to cross Spitsbergen, he was selected to join the 1924 Everest trip, predominantly because of his youth and energy. Today we fly to Nepal in hours, but in the 1920’s the journey took weeks by ship to India, steam train to Darjeeling and then on foot across Tibet to Everest. Julie presented beautiful images of Irvine in everything from summer deck wear and straw hat on the voyage to the rugged adventurer of the Tibetan Plain. Irvine revelled in the experience and thoroughly enjoyed every minute of the trip, particularly the Darjeeling Himalayan Railway. At the time, there was a great debate on the use of oxygen in mountaineering. Some thought it vital, others thought it cheating. That debate still goes on to this day. Irvine’s ingenuity saw the sets redesigned, predominantly in the field with basic tools, such were this mans talents. He changed the design of the flow regulators so that you could alter them yourself and made the sets stronger and less cumbersome. All this in his early 20’s. Another great achievement was the construction of a rope ladder to help the porters climb on the North Col – something they were scared to do because of a previous avalanche which killed a number some years before. The rest, as they say is history. The final reports from the mountain are well documented and since then the world has argued the point of whether they made it to the summit, 29 years before Hiliary and Tensing. In my view, that debate will never end. Such is the feeling in the Mountaineering world about this question that expeditions have been sent specifically to find the bodies of Mallory and Irvine and their camera. It is thought that pictures from this will once and for all answer the summit question. I remember well the moment that Mallory’s body was found. I was watching the TV from my Alaskan Hospital bed after suffering severe frostbite. Even with such injuries, I couldn’t take my eyes off the screen. Speculation was abound about the summit and theories went this way and that. My own view is that we should let the dead lie where they are and not go chasing after ghosts. Does it really matter if we find the camera? The legend is much more interesting. When I returned home from Alaska my father presented me with a very similar camera as a gift. It was his fathers and he thought I should have it. I gently opened the case to find original film still inside. It was successfully developed, but contained no pictures of Everest, only me and my sister on Margate Beach in 1971! Julie said ‘there was a tremendous buzz from the audience and that makes talking a real pleasure’. Her Q & A session allowed us to get even closer to her and her thoughts. It’s great when a speaker engages so intimately with their audience. My thanks to Julie for allowing me to use the images of Sandy in this Blog. Derby Live has once again brought top quality speakers to the city and long may they continue to do so. A packed house watched in awe at Julie’s presentation and I can only recommend that everyone should see her. Unfortunately her tour is almost over, but I’ll see her soon at the Kendal Mountain Festival where we will both be presenting. Julie, can you give me the contact for the person/firm which developed that old film? It was at a now closed camera shop in my hometown. We managed to get the film out in one piece using a dark bag and then it was processed. When someone as good as Mr Frostbite himself says he was stunned, you know you’ve seen something very special! An excellent overview of a fabulous evening’s entertainment, thanks Nigel. 2018 – Peace at Last..?